This Agreement is made on _____________________, between Commercial Landlord LP, a _____________ partnership, ("Landlord"), whose address is ____________________, and Acceptable Restaurant Tenant, Inc., whose address is ________________________ ("Tenant"). WITNESSETH THAT, the Landlord does hereby lease to the Tenant and the Tenant does hereby rent from the Landlord the premises more particularly described in Exhibit "A" attached hereto, and incorporated herein by reference. 1: The term is for five (5) years commencing on the date that a Certificate of Occupancy for Building B is issued by the ______________ ("City"). 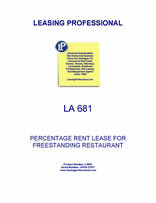 The premises are to be used and occupied only and for no other purpose than the operation of a restaurant. The Tenant covenants and agrees to pay to the Landlord rent as set forth in paragraph 28. 2: The Tenant has entered into this lease without any representation on the part of the Landlord as to the condition of the land. The Tenant shall take good care of the premises when constructed and shall at the Tenant's own cost and expenses, make all repairs, including painting and decorating, and shall maintain the premises in good condition and state of repair, and at the end or other expiration of the term hereof, shall deliver up the rented premises in good order and condition, wear and tear from a reasonable use thereof, and damage by the elements not resulting from the neglect or fault of the Tenant, excepted. The Tenant shall neither encumber nor obstruct the sidewalks, driveway, yards, entrances, hallways and stairs, but shall keep and maintain the same in a clean condition, free from debris, trash, refuse, snow and ice. 3: The Tenant shall promptly comply with all laws, ordinances, rules, regulations, requirements and directives of the Federal, State and Local Governments or Public Authorities and of all their departments, bureaus and subdivisions, applicable to and affecting the said premises, their use and occupancy, for the correction, prevention and abatement of nuisances, violations or other grievances in, upon or connected with the said premises, during the term hereof; and shall promptly comply with all orders, regulations, requirements and directives of the Board of Fire Underwriters or similar authority and or any insurance companies which have issued or are about to issue policies of insurance covering the said premises and its contents, for the prevention of fire or other casualty, damage or injury, at the Tenant's own cost and expense. 4: The Tenant shall not assign, mortgage or hypothecate this lease, nor sublet or sublease the premises or any part thereof; nor occupy or use the leased premises or any part thereof, nor permit or suffer the same to be occupied or used for any purposes other than as herein limited, nor for any purpose deemed unlawful, or extra hazardous, on account of fire or other casualty. 5: No alterations, additions or improvements shall be made, and no climate regulation, air conditioning, cooling, heating or sprinkler systems, television or radio antennas, heavy equipment, apparatus and fixtures, shall be installed in or attached to the leased premises, without the written consent of the Landlord. Unless otherwise provided herein, all such alterations, additions or improvements and systems, when made, installed in or attached to the said premises, shall belong to and become the property of the Landlord and shall be surrendered with the premises and as part thereof upon the expiration or sooner termination of this lease, without hindrance, molestation or injury. The Landlord consents to the alterations and improvements to be constructed by tenant as set forth in plans and specifications with revisions through _______________, consisting of __ sheets prepared by _______________.